The stock has nearly quadrupled, but now is not the time to rest on Pandora. NEW YORK (TheStreet) -- ICYMI (and how could you given the incessant gushing in the media): Beats Music is coming January 21. The arrival and subsequent success of Beats will be good for the best consumer space going -- Internet radio. Each platform provides a slightly different experience. Listeners will sort themselves out among the many options and the chips will fall where they may. But nobody's going to kill or crush anybody. Don't expect the major players -- Pandora (P and Spotify -- to "die" anytime soon. You would think we would be past such poppycock. But, really, what a bunch of useless wonders. Bottoming out and then soaring, gyrating less wildly every time the notion of a "Pandora killer" surfaced. Of course, the media could have spent this time trying to learning about the company, not overhyping a demise that never had a chance of happening. If you search for stories on Pandora today, you find nothing but glowing endorsements. Everybody's all psyched-up about the company's targeted advertising platform in and out of the car. And, suddenly, that Music Genome Project is pretty exciting. Stuff I've been yelping about since Pandora went public. The media's chock full of masters of the obvious and "reporters" -- people who report what already happened or what companies direct them to report with press releases designed to make said company look good. The most intriguing thing to me about all of this -- if there was a ever time to get thoughtfully critical on Pandora (not that the media ever really led meaningful conversations on the company), that time is now. 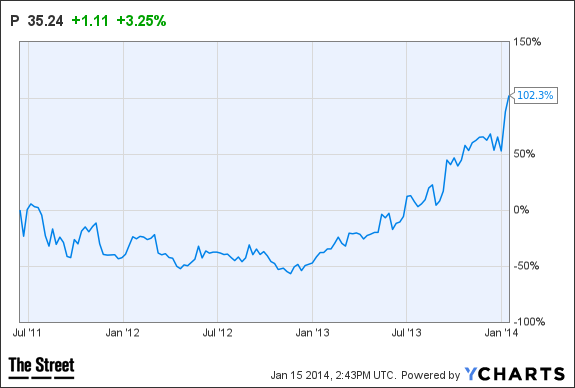 Pandora is a company that has amassed a huge lead over its competition. It has unprecedented scale. Nobody, except maybe Apple, will be able to match it overnight. But we'll have Spotify, Beats and others coming for it. While I think Pandora continues to beat off the competition, we would be foolish to do anything but proceed with caution. So, as the media jumps on and blindly rides the bullish side of their dichotomous bandwagon, you and I will actually do some worthy and useful forward-looking analysis. Time to step up the game on Pandora and Internet radio like never before. Because this is when it counts ... after you (and it wasn't just me, TheStreet's Chris Ciaccia portended the move higher with a solid analysis in August) have called a run from the single digits to $35 a share. That's not a time to claim victory. It's a time hunker down and do even more thinking and homework. In the coming weeks on TheStreet and in our discussions on Twitter (TWTR (@Rocco_TheStreet), we'll consider some important points. I'm most interested in Pandora's unwavering focus. It keeps no secrets -- the company views itself a radio redefined, an engine for personalization and music discovery. You don't get a whole lot of bells and whistles with the Pandora platform. Though you did get an announcement Tuesday that sent the stock higher -- Pandora will leverage Music Genome Project data to recommend custom artist stations to iOS and Android users. The other guys are always adding features, but it's not because they're operating from a position of strength. In fact, it's just the opposite. They can't be -- or at least do not have the time and/or will to be -- quite as focused on Pandora because they need to add scale. Now. Without scale, you can't sell advertising and/or generate a significant amount of subscriber revenue. So some see features as a pathway to scale. Pandora has never viewed it that way. It was and remains patient -- even stubborn at times -- and things have worked out. However, has it reached the point where it needs to step out a little and open its platform up to more creative uses? Also, you know I consider services such as Spotify complementary to Pandora. But they're still competitive in that when you decide to go to another place for your entertainment you're not going to Pandora. In this regard, you can consider pretty much anything a competitive threat. So, it's an interesting topic and one that Pandora should considering internally. It's OK to be passionate about the complementary nature of streaming and on-demand Internet radio, however don't let your passion turn to stubbornness and a nap at the wheel. The Music Genome Project, in conjunction with Pandora's massive user base and treasure trove of thumbs up/thumbs down data, allows the company to target listeners on the basis of factors such as age, location and musical taste. It already uses this powerful capability to sell advertising and drive listeners to free shows. Don't expect it to happen overnight, but, at the same time, don't expect the company to stop where it is now. And, at CES last week, the news that came as no surprise to those of us who actually follow the company -- not inaccurately sensationalize it -- was that Pandora doesn't intend to stop. In fact, it never has. It's just that few people were paying proper attention. Despite a nearly quadrupled share price, Pandora hasn't really won a damn thing. The game remains in the early innings. And, even though the Pandora narrative remains intact, the company needs to be better than ever. And that means it might have to swallow some pride and change. Disclosure: TheStreet's editorial policy prohibits staff editors, reporters and analysts from holding positions in any individual stocks. Rocco Pendola is a columnist for TheStreet. Whenever possible, Pendola uses hockey, Springsteen or Southern California references in his work. He lives in Santa Monica.